With winter in full effect, we’ve seen the puffer jacket make a comeback. But this time it’s not strictly for winter wear. 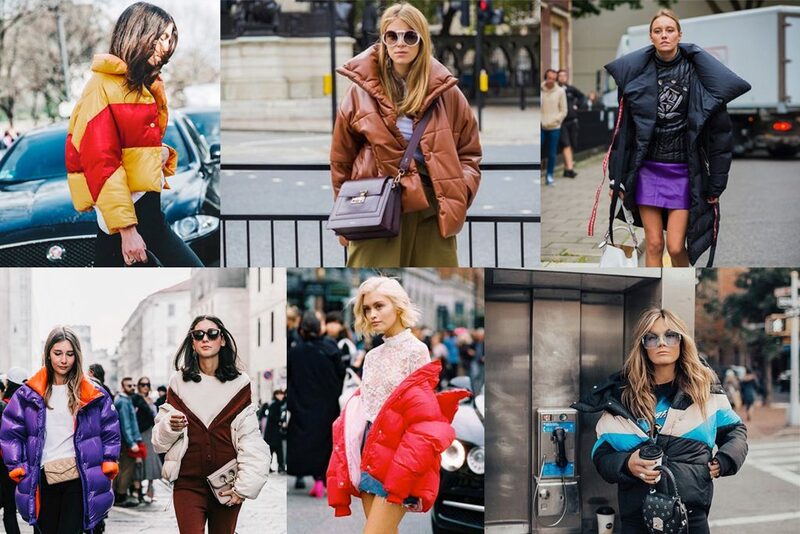 Puffer jackets have been spotted on street style looks making it possible to style this outerwear for every day. Not only are they coming in all shapes and sizes but different prints too. 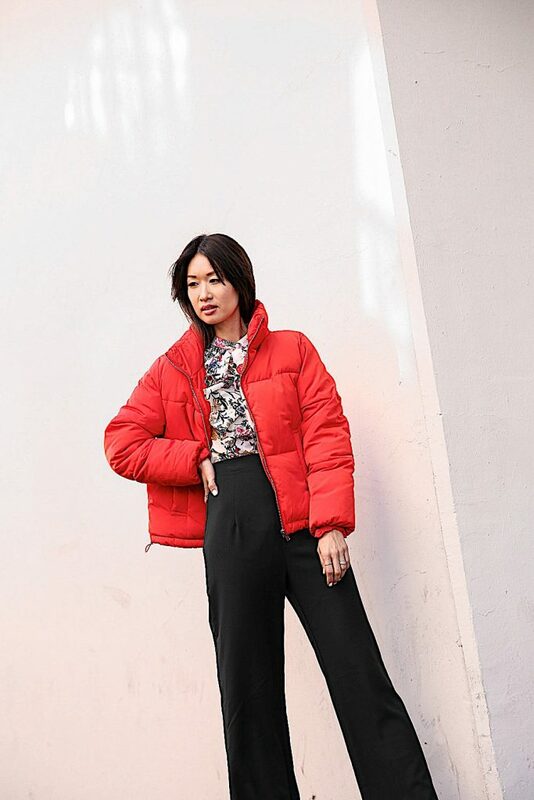 To step out of the box, I wanted to style my HM puffer jacket with something other than streetwear or athleisure showing that you can pull off a puffer jacket with just about any look. For the first look, I mixed a more chic and polished outfit with the puffer jacket. These are my go-to high waisted pants for obvious reasons – they make anyone’s legs look a mile long. With spring just around the corner, this floral blouse with high neck is the perfect transition from winter to spring. I also love that a puffer jacket dresses down a look while also maintaining a street style edge. I’ve had this leopard maxi dress forever and I wanted to wear it during the day so I paired it with the puffer jacket to make it more suitable for winter and for a casual day out. Besides, who doesn’t love a leopard print and red combination? These are just two ways to style the must-have puffer jacket of the season. Here are some of my other favorites that I found on Pinterest. Shop some of these fabulous puffer jackets here (many are on sale right now)! How would you style a puffer this winter? I saw that puffy jacket when you are wearing in for the H&M even and totally wanted it as well!!! I have a black one, but it is not nearly as puffy nor warm looking. 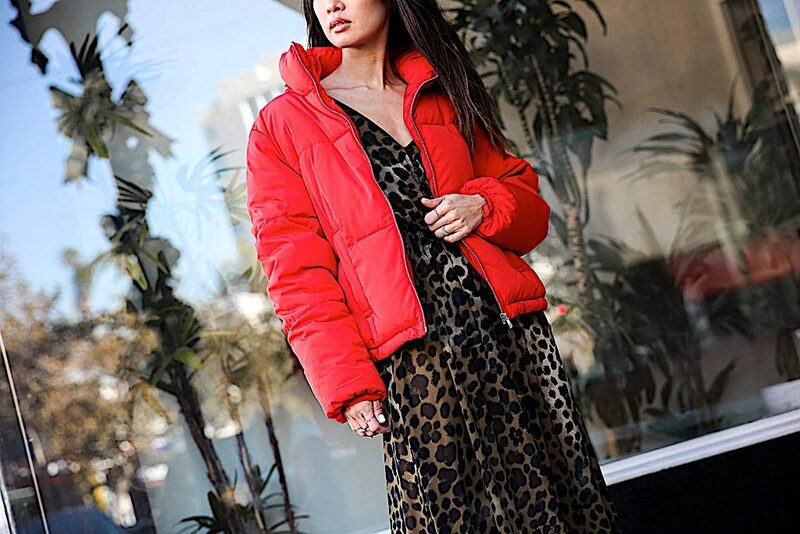 It is a shame that we don’t even get nearly as cold here in LA to wear puffy jacket, but this would be perfect for the East coast but totally love how you styled it with the leopard print dress to tailor to our climate!! Great selections to choose from. I love the coat. It looks really cozy, and warm. Absolutely in love with how you styled this puffer jacket! <3 🙂 Sooooo chic! Wow, you make puffer jackets look really chic babe! I feel so frumpy in them, lol. I love that bold, vibrant red tho. It would pair so well with any outfit. I totally agree with your styling and would have paired it with high waisted pants. Your legs look sooooo long!! I’m always cold so I would definitely wear puffer jackets year long since it can get cold in the morning and at nights. Thank you LA desert weather… You look gorgeous!! I love the ways you have styled this one! I have a puffer long coat and a vest but I never really wear them all that much, or save them for a basic jeans look. When it gets cooler I will have to try playing around with them to put something new together. I totally love your combo with the leopard dress, such a unique look. The red puffer jacket is so eyecatching, very gorgeous. 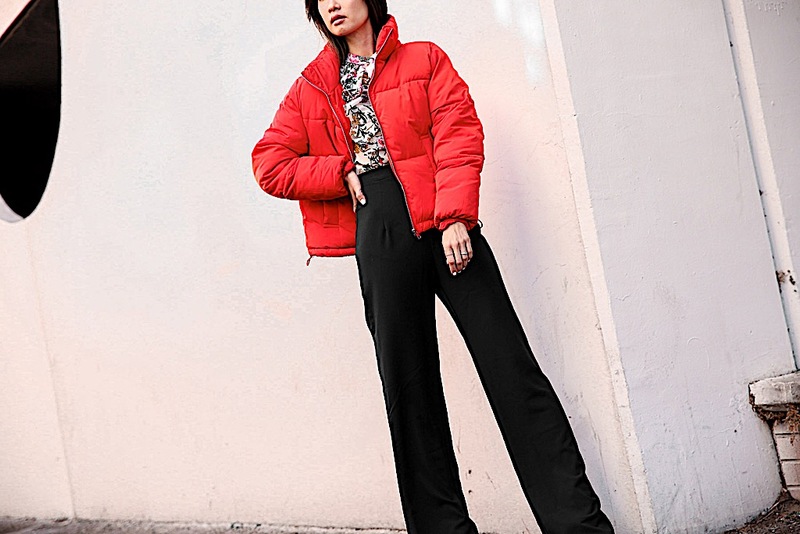 Love the bold red colour of the puffer, definitely my fave kind of look! Love the color of this coat on you. I think the trend is a fantastic one. I’d be nice for this one to stick around. As a Canadian, I was always wearing down puffer coats for years and even if it wasn’t a trend, I really couldn’t bear to walk around outside in minus 40 wearing just a couple of knits and a wool coat – just doesn’t do it for me… I’d freeze. lol I love that you wore yours with a floral top. Such a great mix! Puffer jacket is definitely on my list to purchase, but I decided to skip this year, because I purchased winter parka from Mango. I love that H&M always have stylish and trendy pieces. Red looks fabulous on you. I super love the puffer trend right now. Aside from the fact that they’re extremely cozy and practical, they come in really cute colors too. They make really interesting pieces for almost any outfits. Love that you paired it with leopard dress dear! Such a posh look! I finally got one puffy jacket for my self! This blog post defiantly helps for styling. I will never think of styling puffer jacket with long dress! thank you for inspiring love! You look so classy wit it..
You got me there, girl! I’m literally obsessed with this puffer trend. Already bought a couple of pieces from H&M. Love the way you style this jacket with both trousers and the dress. Looks so bold and sophisticated at the same time. This is a lighter way to wear the puffer jacket which is what we need here in Australia since we don’t get extreme cold weather. Glad to see this kind of styling. I don’t know how you manage to make a puffer jacket so awesome in a street style way! I love the bold red color paired with the leopard print! Love how you styled the puffer coat babe!! My fav one is with the leopard dress!! Yay! Girl, you can’t stop inspiring us with your super trendy outfits! 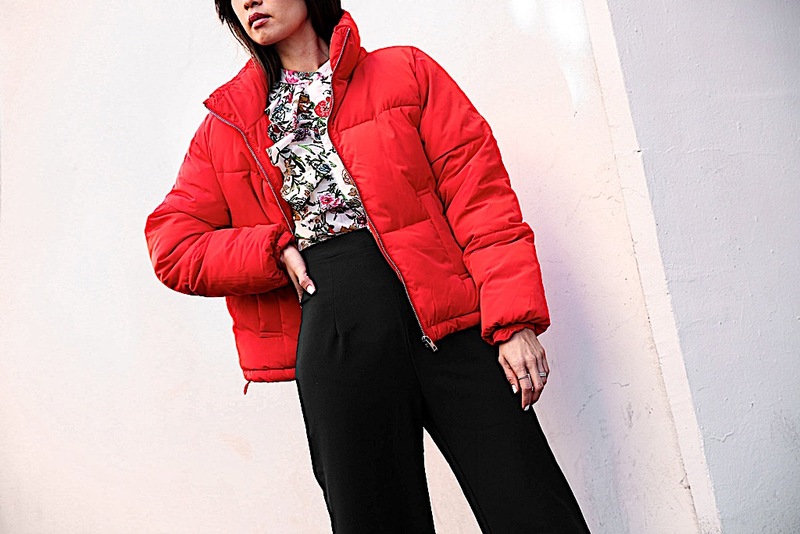 This HM puffer jacket combined w wide-leg trousers is looks amazing, as well as with dresses. Love your selection of streetstyle photos! Want to copy them all! I love puffy jackets! I wear them all the time! The puffer jacket is so cool . I lie how you styled in the both way. I need to get one also for me, maybe yellow . What do you think? I have been all over the puffer jacket trend myself and went a little crazy for Black Friday and got most of the colors, everything except red! I may have to return for this one next. It looks so good with that leopard dress! I love that red puffer coat! It’s so bold and fun! I also like how versatile it is. It especially looks great with the leopard print dress. I’m so glad this is a trend now because they are the most comfortable thing ever! Every winter I struggle with the low temperatures while trying to stay warm and look good at the same time, this year that’s not an issue! I love the way you put all the pieces together, you look stunning!